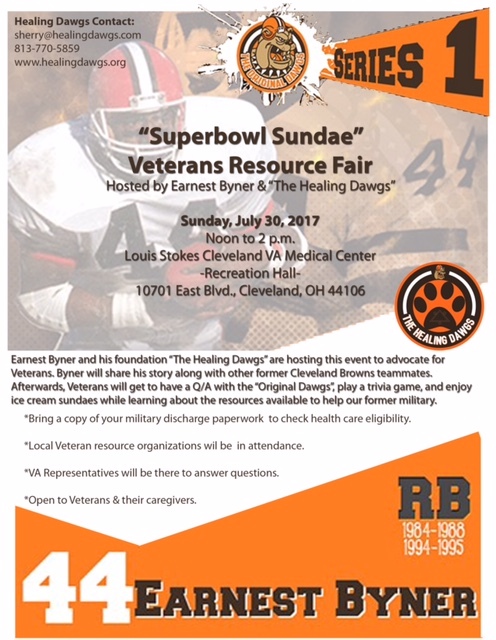 MEDIA Note: Calling all Veteran’s to join us for a “Super Bowl Sundae” event hosted by NFL Legend Earnest Byner and his non-profit, “The Healing Dawgs” at the Louis Stokes Cleveland VA Medical Center. Earnest Byner will be promoting the VA Resource Fair to advocate for serious issues confronting the Veterans and support the VA’s commitment to provide resources. NFL’s Earnest Byner along with his foundation “The Healing Dawgs” and the Cleveland VA Medical Center will Host a “Super Bowl Sundae Social” and VA Resource Fair to Promote Veteran Wellness – Mind, Body and Spirit. CLEVELAND – Veterans and their family members will be treated to a unique opportunity to meet Former NFL Player and Coach, Earnest Byner along with some other teammates for a “Super Bowl Sundae Social” at the Louis Stokes Cleveland VA Medical Center at 10701 East Blvd., Cleveland, OH 44106. The event will be held Sunday, July 30th from noon until 2 p.m. in the medical center’s Rec Hall and will include Byner sharing his inspirational story of overcoming the famous “Fumble” during the 1987 AFC Championship between the Browns and Broncos. Veterans will engage in a question and answer panel with former NFL Players from the Cleveland Browns. ”The Original Dawgs”. Veterans are invited to participate in a Super Bowl/Cleveland trivia game with prizes, and conclude with an “Ice Cream Sundae Social”. Byner is humbled to partner with the Cleveland VA Medical Center because he understands the connections between some of the medical issues that former NFL players and former Military personnel have in common and need to heal from such as Concussions/TBI, Suicide and the epidemic of Drug Use. Byner and The Healing Dawgs will continue to partner with the community to advocate for Veterans, children and the homeless to promote healing of the mind, body and spirit, and to teach how to love from the inside. “Together we are working to provide hope for our future,” said Byner. Veterans are encouraged to bring their discharge paperwork to verify healthcare eligibility. Representatives from Veteran resource groups will be on-hand to provide information and assistance to Veterans in attendance. For more information about this event or to coordinate a media interview, please contact Kristen Parker at 216-301-9462 or kristen.parker@va.gov.